As some of you may know I have been plotting to start my own baking and catering company for a very long time. I guess if you read the Hello Kitty post you would know. Well I am very much well into the process of doing this...well I have a logo and a partner. My partner is an old friend of mine, she has been my friend for 16 years (what? wait? how old am I again) and one afternoon we played around with the idea and play turned to seriousness and now well..you will soon see the results. I was compiling my CV the other day, filling in my education details and long forgotten high school awards, when I reached the subsection entitled, “Hobbies and Interests”. About two years ago, when I last needed a CV, I would've written, 'writing, photography, cooking, reading and travelling,' but that was before I became a full-time pastry chef. My actual hobbies now involve working, eating, sleeping, then repeating the process on a daily basis, with extra sleep on Sundays, when possible. Travelling now means going to Mossel Bay on occasional weekends to prove to the in-laws that I'm still alive, and photography is something I do with my phone when I see my friends, (or their pets) in embarrassing situations. Enter Mister Retrenchment. With a week's notice, I now have all the time in the world to do as I please. I can stay in bed all day, catching up on all the books my iPod can handle, or I can stare at Facebook until I'm blue in the face. Just knowing I have the choice is enough to put a smile on my face and make me forget the rising dread of the upcoming job search. I now have TIME to pick up my camera, my notebook and my whisk and juggle them in the air until they blur my vision and form the amalgam that lies before you; a food blog post. LadyRaven picked a good day to have me as her guest blogger, because I made the yummiest batch of chocolate brownies this afternoon. They're not just good, they're completely transcendent. I usually make brownies with toasted nuts, but today I was only after chocolate; as much of it as I could fit into one recipe without losing the cakey, fudgy texture that is characteristic of this all-American treat. I'm working on the food photography, it's far from perfect, but I'm pretty sure I got this recipe right; a dense chocolate brownie with a just-set fudgy centre and a thin top crust. Not for the faint of heart or the weak of will, this recipe only makes 9 brownies, so hide them away from yourself if you're planning on sharing with someone who won't be around when they come out the oven. If you can hold out long enough, they keep nicely for up to 3 days. Preheat the oven to 180 and line a 20 x 20cm baking pan with baking paper, cutting down the corners of the paper so that they don't crumple in the pan. Place chocolate and butter in a medium-sized heat-proof bowl over a pot of gently simmering water and stir until completely melted and combined. You should have a smooth, glossy chocolate liquid. Remove bowl from the heat and whisk in cocoa powder, then eggs, making sure the mixture stays smooth. Continue stirring as you add the sugar and vanilla extract. Lastly, stir in the sifted flour and stir well to combine. Scrape the mixture into your prepared pan and bake for about 25-30 minutes, depending on how gooey you want your brownies. My oven is a bit strange, so check on the mix after about 20 minutes to make sure it's baking evenly, before deciding how much longer you'll want it in the oven. Once done, cool completely before cutting. Trust me, it's worth the wait. You might also want to close all your windows, so that the neighbours don't crawl through them when they smell the deliciousness wafting through the air. 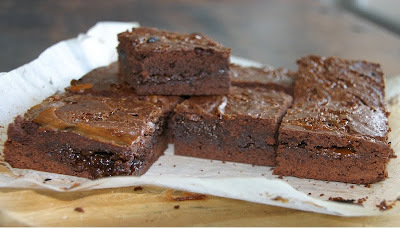 These brownies are too good to share, unless of course you have a glass of fresh milk with which to devour them. Happy baking! DRooooooooooool - that looks like the perfect brownie. Think ThePartner should have her (his?) own foodblog! Good heavens! This kicked my morning from dull to delicious! I think (think, mind you) that even I, retarded-baker-not-so-anonymous might be able to make these! Good heavens, how divine, and yes, perfect. Fudgy, chocolatey insides, and slightly crusty exterior! Milk and rich sweet chocolatey things, the perfect mood re-adjusting foods!